Lamont wants to make college free for vets. Here's how much that would cost. Ned Lamont’s (foreground) plans are embraced by veterans at a war memorial in Berlin Thursday. Ned Lamont promised this week to make college free for veterans attending the state’s public colleges if elected governor. State law already requires the University of Connecticut, regional Connecticut State Universities, and community colleges to waive the tuition veterans would have to otherwise pay. 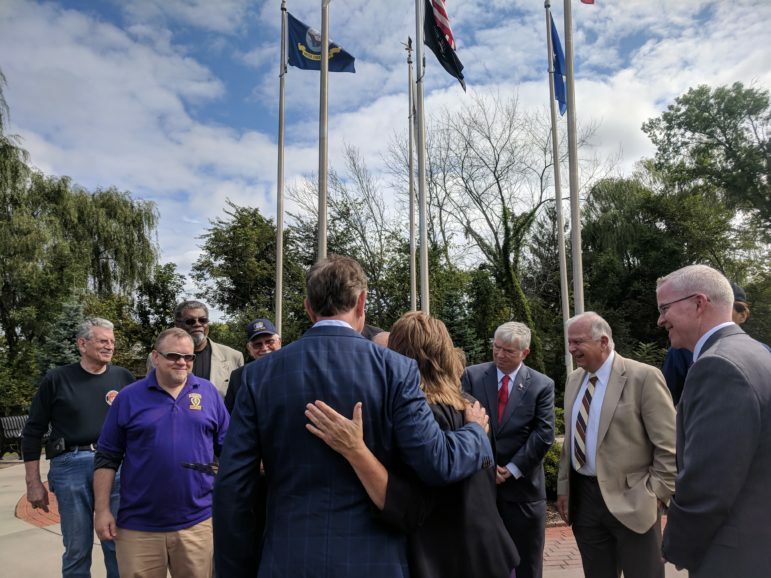 On Thursday – standing with veterans at a war memorial in Berlin – Lamont promised to go one step further by also requiring colleges waive the fees veterans must also pay to attend college. The legislature’s nonpartisan Office of Fiscal Analysis estimated 18 months ago that expanding the existing benefits would cost almost $5 million a year. In addition to school fees, which typically cover anything from parking to recreation to construction projects not paid for by the state, Connecticut veterans still have to pay for their housing and meal plans if they live on campus. The majority of them do not, however. These state-funded benefit are crucial for individuals who are either not eligible for the federal GI Bill to help pay for their college, have only partial benefits, or who have already used all their benefits. The state’s four regional Connecticut State Universities enroll about 1,100 veterans each year and the annual mandatory fees that Lamont proposes waiving are between $4,801 and $5,495 a year, depending on the university. That’s about the same amount students currently pay for tuition to attend these schools. At the state’s community colleges, 1,481 veterans enrolled last school year. The annual mandatory fees at the community colleges is $460, which is 10 percent of the total cost to attend. At the University of Connecticut, the mandatory student fees are $2,882 this school year, which is roughly 20 percent of the cost. This semester, 187 veterans and National Guardsman had their tuition waived at UConn. Lamont did not say whether he would have the state budget pick up the additional cost of waiving veteran’s fees or if he supports requiring the public colleges to absorb the cost of such a mandate. When the General Assembly considered legislation that would do away with the fees vets pay in 2017, the Board of Regents opposed such a measure without state funding simultaneously being provided. “Without accompanying state funding, these costs would need to be passed on to other students in the form of tuition and fee increases or cuts in services,” testified Sean Bradbury, the legislative liason for the community colleges and state universities.